A couple of Christmasses ago I wrote about the Christmas lights in Hong Kong. They are on a massive scale, with many taking up the whole side of a skyscraper! Back then, I lived in Happy Valley, so my view was mainly of the lights on the Hong Kong side, but there are more lights to see on the Kowloon side too. To take a look at this year’s lights, I took a nice stroll along the promenade from Hung Hom all the way to the Star Ferry in Tsim Sha Tsui (TST) (which takes about an hour). 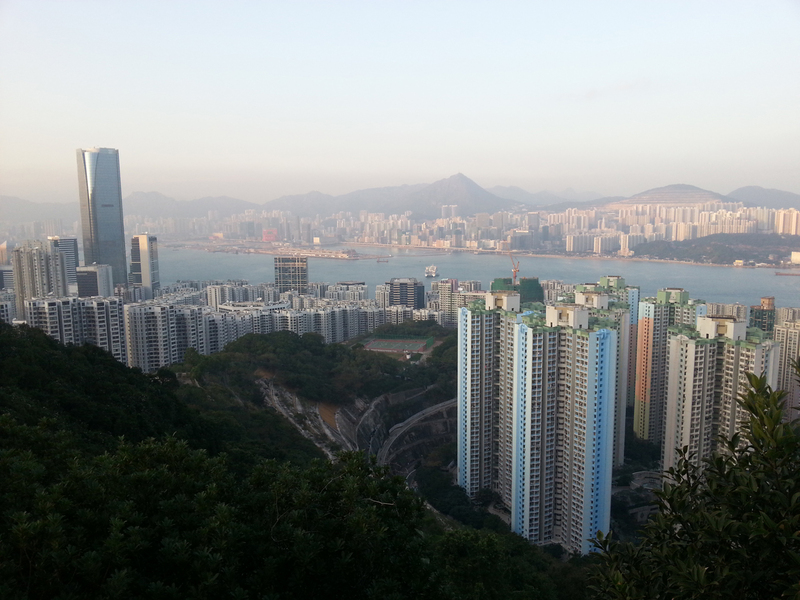 As you walk along the promenade in Hung Hom, you get a great view of the eastern half of Hong Kong island. There was only one building with lights on, possibly in Quarry Bay, so I didn’t take a photo of the view in this direction. But as I approached the end of the walkway in Hung Hom, I could see some buildings with Christmas lights in Causeway Bay and Wan Chai. At this point the path cuts in, away from waterfront, and takes you up along the side of the Harbourfront Horizon estate and over the Central Tunnel. You soon descend again into East TST, where you can see the lights on a group of buildings that are full of shops and restaurants. The Shangri-La is definitely the most tasteful, although it may be limited as to where the lights can go since guests won’t want lights in front of their hotel room windows! At this point we were diverted away from the waterfront again, this time due to a massive building site which has shut the Avenue of the Stars, so we had to walk along Salisbury Road instead – not very scenic! But at least it did mean that we could see the Peninsula Hotel lights, which were very similar to last year but very pretty – with snowflake-shaped lights hung across the gap in the middle of this U-shaped hotel. After the Peninsula, you can see the display in Heritage 1881. There is some kind of display here all year round, and it’s never really to my taste but there are always tourists having their photos taken with it! This Christmas they seem to have gone for an ice-palace type theme (excuse the terrible quality of this photo which was taken from the other side of the road!). Our next stop was the Cultural Centre and clock tower, where I had heard there would be lights, but there was nothing to see! I was a bit puzzled at the time but now I realise that we were just there at the wrong time. There is a 3D light show at 8.20, 8.45, 9.15 and 9.45pm every night until 28th December (more details here), and we were there about half an hour too early to see the first one! Oh well. You do get a great view of Hong Kong Island from the waterfront here though, so I was able to get a shot of some more of the buildings that were lit up, this time looking towards Admiralty and Central. Finally, we headed over to Harbour City (just the other side of the Star Ferry) to see what display they had outside this year. They seem to have gone for a retro Disney themed street! Not really to my taste but it was pretty packed with people having their photos taken with the displays. And now our walk was all done! We turned around and headed home on a bus from the Star Ferry. I feel like many people stick to the Hong Kong side when looking for Christmas displays, but as you can see there is lots to see on the Kowloon side too! Let me know if you check them out! There is a bar called Ozone on the top (118th) floor of the ICC (International Commerce Centre), which is the tallest building in Hong Kong – and the 6th tallest building in the world (ref). Tom and I have been to this bar a couple of times in the past but I have always disliked it – it is very pretentious, and the poor air quality in Hong Kong means that you can never see that far through the haze (and often it is swathed in cloud so you cannot see anything at all!). In fact, for a bar with a view, I’d much rather go to Aqua Spirit as I mentioned here. However, in the last few weeks, Hong Kong has enjoyed a rare spell of clear air where the views can be seen for a long way, so we thought we’d give the bar another go and see if it is actually worth braving the pretentiousness! Anyway, finally the Ozone bar has come into its own – the views were truly fantastic. And the cocktails weren’t bad either. This photo is looking East along Victoria Harbour. 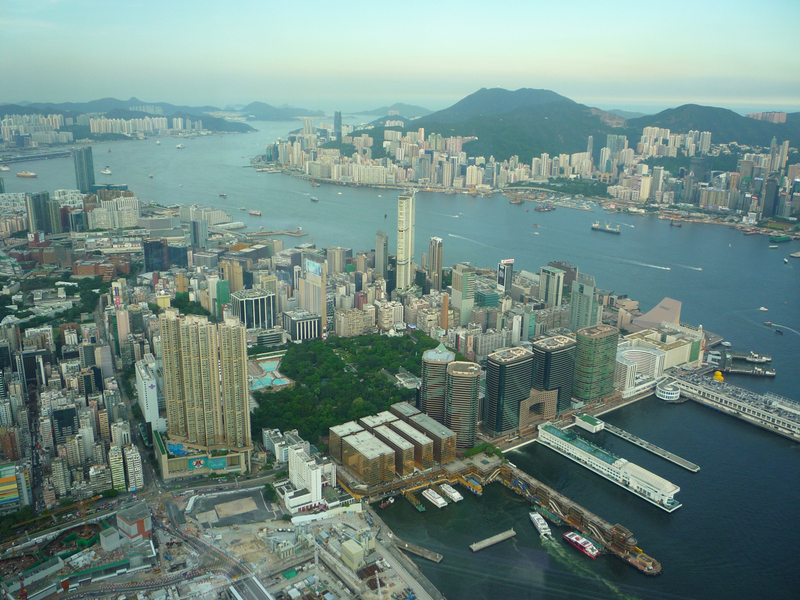 Hong Kong island is on the right of the picture and the Kowloon peninsular is on the left and foreground. 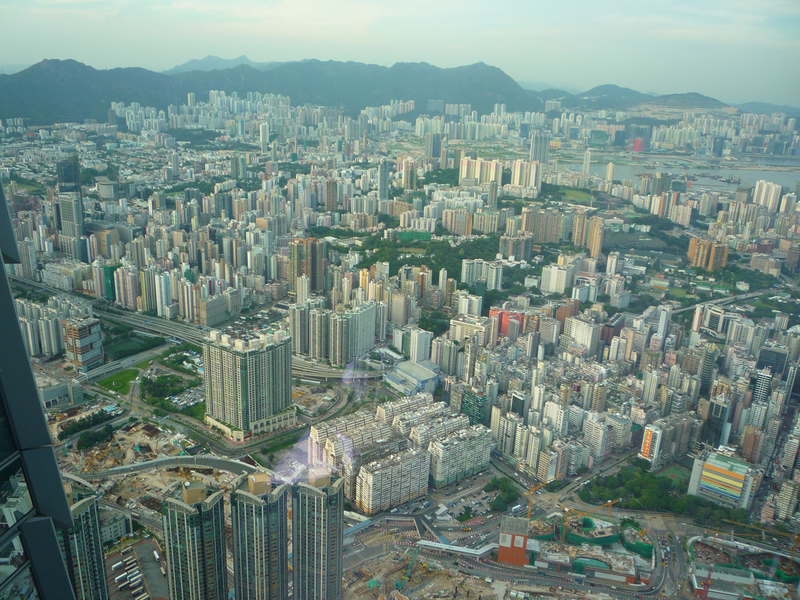 …and Central and Sheung Wan. The things you can see sticking out at the bottom of the picture are the ferry piers at Central. 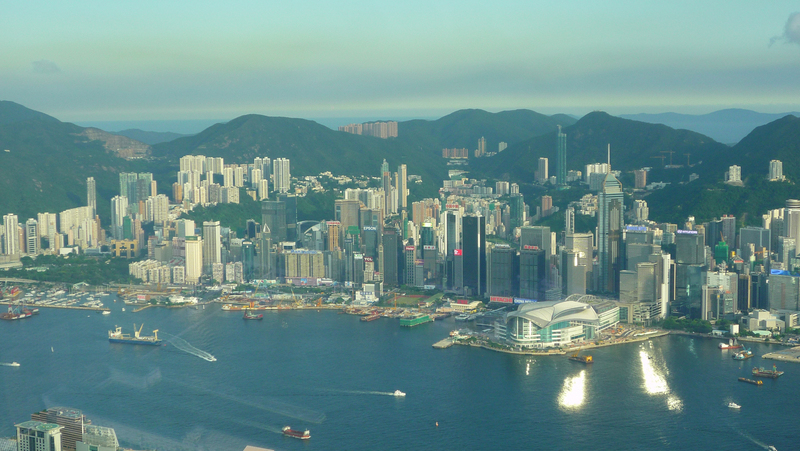 Going further West on Hong Kong island, here you can see Kennedy Town and some of the islands in the background. 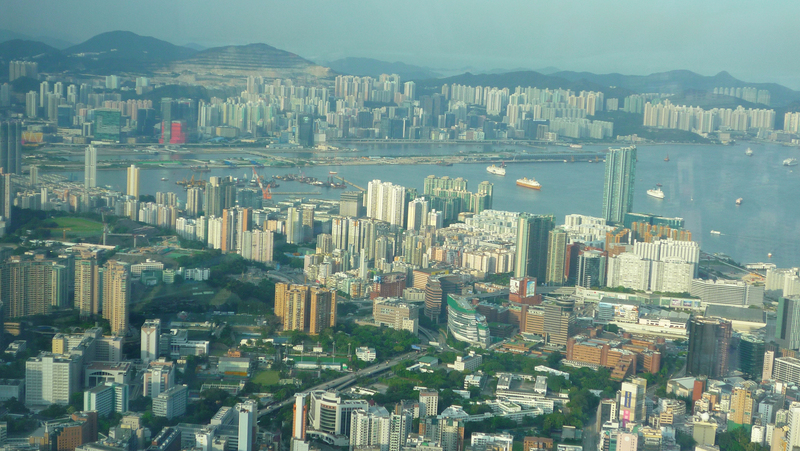 Looking at the Kowloon peninsular, here you can see Hung Hom in the foreground and the old Kai Tak airport runway sticking out into the water in the background. 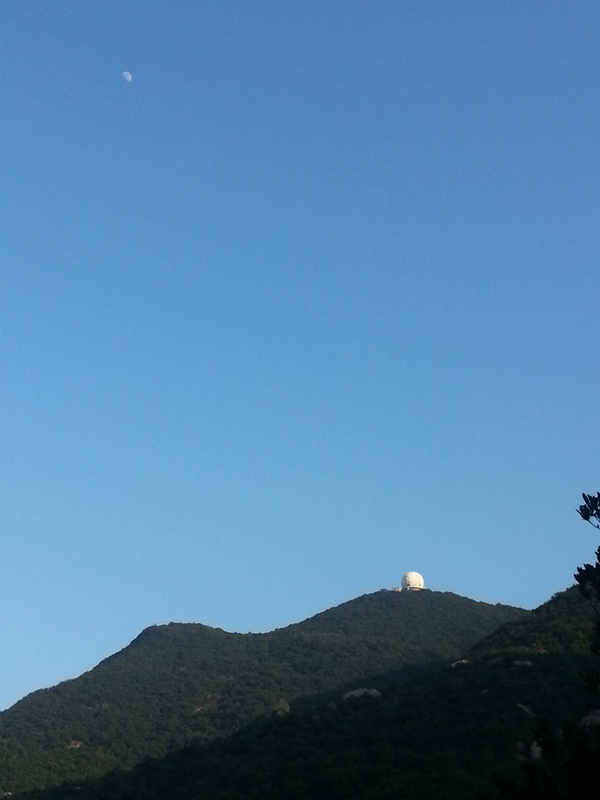 And this is looking more inland across the Kowloon peninsular. 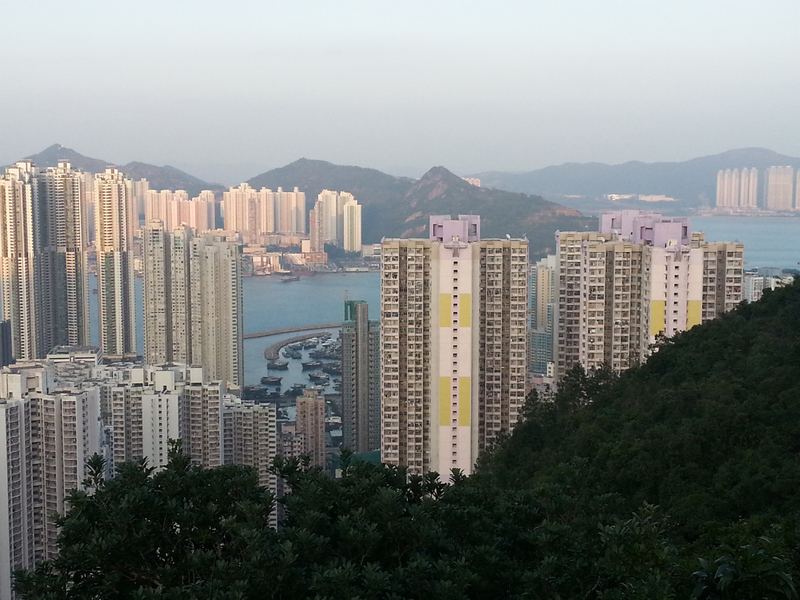 I think the really built-up area on the left is Mong Kok. I was surprised to see a fair amount of green areas in between the skyscrapers (mainly towards the right of the picture). 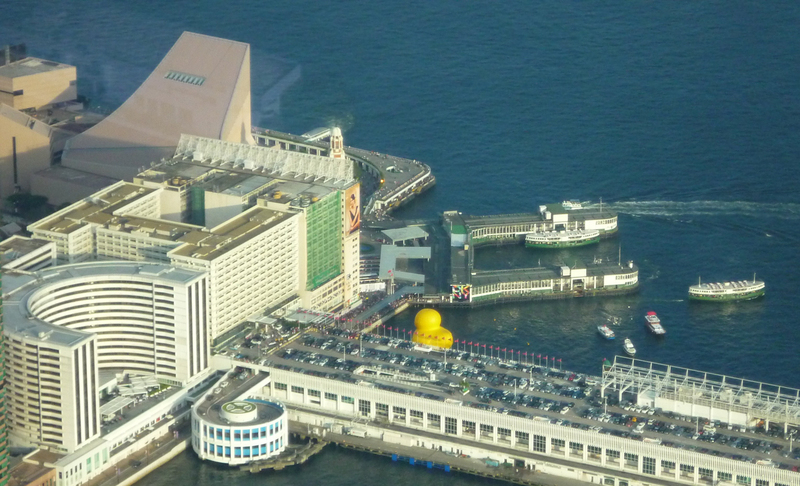 I couldn’t finish without a close-up of the Star ferry piers and the giant inflatable duck (the yellow thing) that has caused much interest in Hong Kong! This dim sum restaurant was recommended to us by a couple of people and one of the restaurants in this chain has a Michelin star! We had to check it out, and it was as good as we were told! The dim sum is great, and we can eat our fill (and then some) for around HK$120 (approx. £10) between the two of us. Tom in particular is a fan of the enormous glutinous rice dumplings but we also like their take on BBQ pork buns (crisper and sweeter than normal) and BBQ pork rice rolls, amongst others. The two addresses above are the branches that we’ve been to, but Open Rice suggests there are 5 in total. The IFC branch is usually pretty busy. The first time we went we waited for about an hour to be seated. They do takeaway though so you can get your food and go onto the roof of IFC Mall and eat it there! The North Point restaurant seems to be less busy – we went on a Sunday lunchtime and were seated straight away. N.B. When we have guests visiting, we usually take them to Maxim’s Palace in City Hall instead of Tim Ho Wan for dim sum. Despite the fact that you also have to wait a long time to be seated, and it is more expensive (and the food isn’t quite as good in my opinion), it has a great atmosphere as it is set in a large ballroom with ladies bringing trolleys around from which you can select the dishes you want. Definitely an experience I’d recommend if you’re visiting Hong Kong! This place does great xiaolongbao (which I talked about in this post), along with a range of Chinese staples and Shanghainese specialities. I don’t think we’ve ever had anything off the menu that has not been good. The restaurants are nicely decorated and the service has always been excellent. It’s pretty reasonably priced too, most dishes are HK$60 to HK$80 (£5-£7). Again, this is a chain so they are dotted all over Hong Kong but we’ve been most often to the one in Wan Chai. This restaurant serves a great selection of Malaysian cuisine. We’ve had great food and good service in both branches. You must try the roti! This is a type of flatbread and it is absolutely delicious, especially when dipped in a curry sauce. The beef rendang is also definitely worth trying. We also like the laksa and satays. This was another restaurant found on the recommendation of friends and it didn’t disappoint. The setting is lovely, with a large outdoor terrace and the food was great too. I can’t remember what we had but it was all pretty standard Thai food and it was all really nice! The entrance is a little hard to find though, it’s a small doorway on Cannon Street. If you want a nice meal out and you love Thai food, I think this place would be a great bet. Being British, we do love a good Indian curry but we’ve not had much luck finding a great one here in Hong Kong. I know that Chungking Mansions is touted as the place to go, although it’s a bit of a maze (and quite an experience!) and the one restaurant we’ve been to in there was ok but not amazing. But this British bar with an Indian chef seems to do the job just as well, and in a nicer setting. The curries are pretty reliable and we’ve been several times now. It’s not the cheapest, at about HK$100-120 (£8-10) for a curry and rice, but we like it. It’s also a really nice place for a drink and has very friendly staff. Tom and I were converted to Indonesian food on our honeymoon in Bali, and so we were keen to try this place and it didn’t disappoint. The menu has a range of standard Indonesian dishes, along with some that we hadn’t heard of. Some of the standard dishes include Nasi Goreng, which is Indonesian-style mixed fried rice, Mie Goreng, which is fried noodles, and Tom’s favourite, Nasi Campur, which comprises rice and a selection of meats. Having said that, both times I’ve been to Indonesia Restaurant, I’ve had the mixed set lunch, which is a selection of 3 smallish dishes and a drink and cost about HK$60 (£5). I didn’t know what all the dishes were but I enjoyed them all! The service is also great here. We visited this small restaurant for a celebration, and as such it was a treat for us. It cost a bit more than we’d normally spend on dinner (I think the bill came to about HK$1000 (£80) between us), but it was totally worth it! The restaurant is classified as a private kitchen, which means it cannot serve alcohol but they do not charge corkage if you bring your own. It’s situated just off Queens Road East and when you get inside you realise it’s in a residential block! However, the decor is nice, the service was friendly and the food… well, the food… Tom and I are already fans of French food and this restaurant served a very good example of it! The bread was beautiful, we shared a starter platter of meats and pate which were nice, and the mains were also excellent. I’ve forgotten what I had(!) but Tom had the confit de carnard and said it was great. We had a pudding each to finish: Tom’s apple crumble was nice, but my chocolate fondant was gorgeous! A lovely place to come on a date or a special occasion. …this one is not a restaurant but a bar, and one that I’d recommend to all visitors to Hong Kong. 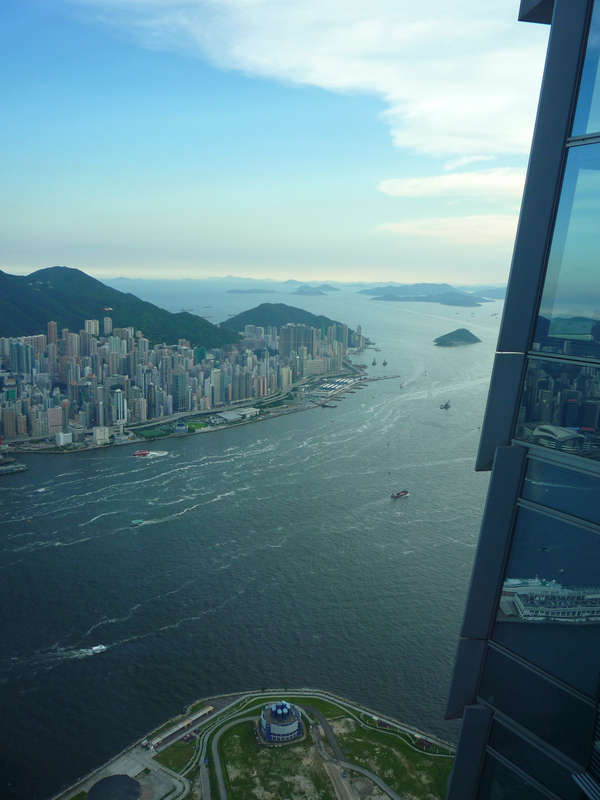 It’s situated fairly high up in a tower overlooking the harbour with a fantastic view of the skyline on Hong Kong island. It’s a really nice bar (significantly nicer, in my opinion than the one at the top of ICC) but it has a dress code – no singlets, shorts or flip flops! Drinks there are about HK$100+ (£8+) for a beer and HK$120+ (£10+) for a yummy cocktail. Go there for one drink at least. You won’t be disappointed. The view really is that good. So what do you think? Do you disagree with any of my recommendations? Or do you have some favourites of your own to recommend? I’d love to hear from you! One weekend Tom and I wanted to go on a fairly short, easy walk so we looked on our Enjoy Hiking app and found the Hong Pak country trail. It’s rated as 1/4 (meaning Easy) is a level walk and is 3.3km long. However, the app also very briefly mentions that you have to walk uphill for 30 minutes to get to the start of the walk! 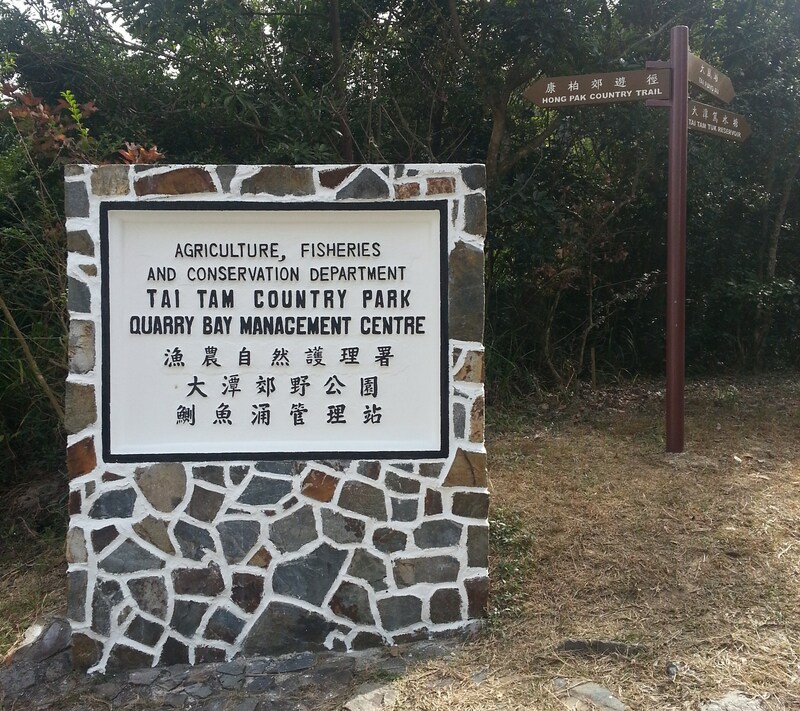 To get to the start of the trail, exit the Quarry Bay MTR station at the main exit, turn right and walk along the road for about 5 minutes until you come to a road (Mount Parker Road). Turn right up the road and keep following it up for about 30 minutes. The road is semi-pedestrianised and if you kept going you would eventually join the Hong Kong trail. You pass a BBQ area and the entrance to Quarry Bay Tree Walk on your way up. …and then immediately right. The trail is signposted to Kornhill, which is the estate you reach at the end of the walk. Follow the trail round. 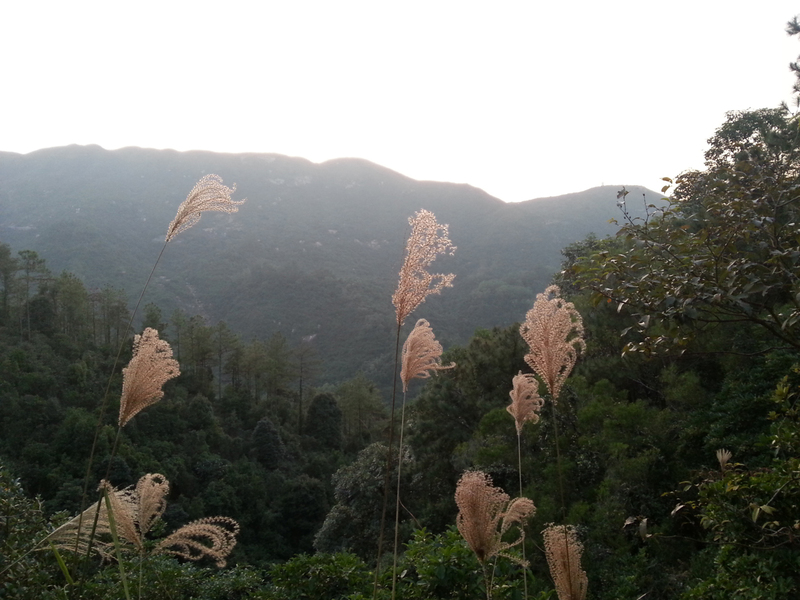 You walk around a pretty level contour around a large valley leading down to Tai Koo. 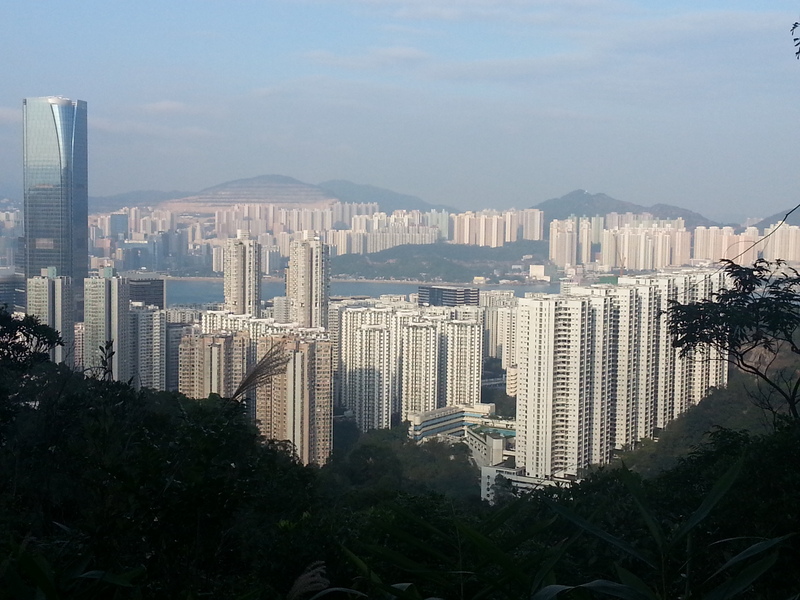 It is mostly forested but every now and again it opens out to lovely views looking back over Quarry Bay and Tai Koo and looking round to the surrounding hills and the other side of the valley. As you get to about 3/4 of the way round (after about 45 minutes), you start walking past forks in the path. Take the left fork each time. At the third fork however, you might want to walk for about 30 seconds down the right fork because you come out on top of a large rock with a great view over Tai Koo and the harbour. Definitely made the whole walk worthwhile for me! I’ve done it twice now and both times I’ve stayed there for about 20 minutes just taking in the view. After you’re done with the view, retrace your steps to the fork and take the other path. Shortly after this you should start descending. Again, at each fork take the left fork until you come to a fairly open area which is the other end of the Tree Walk. This time take the right fork which will take you to Kornhill. Just keep walking down the path. You will walk along the storm drain for a while and will come out into the housing estate. Keep walking down the road (Greig Road) until you get to the main road (King’s Road). Then turn right and after about 5 minutes you should reach an entrance to Tai Koo MTR station. This is a really pleasant walk, but the view at the end is definitely the highlight! We keep thinking we’ll take a picnic up but then we remember how much you have to walk upwards to get to the viewpoint so we haven’t done it yet! We recently had a friend from the UK visit us for just a few days so we spent a while before she arrived trying to plan her visit so we could cram in lots of great things about Hong Kong. When I asked Tom what the one thing that no-one should leave Hong Kong without doing was, he said “take the Peak Tram and see the view from the Peak”. And, to be fair, I agree with him. At the top of the Peak Tram is a viewing tower which you can go up onto the roof of to see the view. This costs about HK$35 (if my memory serves me correctly), and on the night we tried it, was packed with tourists. However, now we know better. And should you ever go to the Peak, please don’t go to the tower! Instead, walk past the shopping malls to the road and turn right down the road. About 30 seconds later, you will reach a junction where the main road turns left. In front of you is a much smaller road called Lugard Road. Walk down that instead. So what do you think? Do you agree or do you know of a better view?! Little Koo blog posts now on GPSMyCity! Enter your email address to follow the Little Koo blog and receive notifications of new posts by email.